Most folks think a great chocolate mousse comes from whipped cream or by adding some dairy product, but the richest mousses I’ve tasted are made by using top notch, dark melted chocolate. This version was gifted to me from a French classmate from college, and every time I make it I think of her! 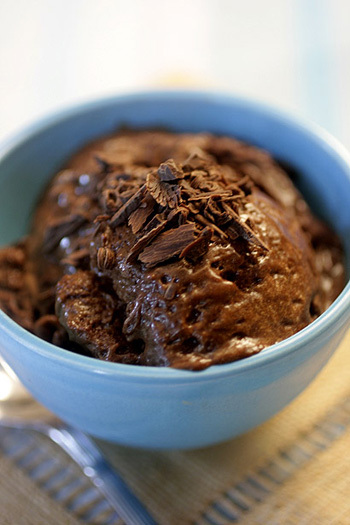 Melt chocolate and margarine in a double boiler, stirring constantly until smooth, and remove immediately from stove. If you don't have a double boiler, create your own by filling a pot with a few inches of water and inserting a bowl inside (the inside bowl should not touch the water). Allow the water to come to a simmer and set heat to very low while you melt the chocolate. Stir in the sugar and egg yolks while the chocolate is off the heat and allow to cool on the counter. Add salt to egg whites and beat with an electric mixer or with a wire whisk until stiff peaks form, and cling firmly when removing the whisk. Another good test - turn the bowl to one side and the whites should stay in place, clinging to the side of the bowl. Fold egg whites into cool chocolate mixture, making sure not to crush the egg whites. Spoon into parfait cups or ramekins. Cover with plastic wrap and chill at least two hours or overnight. Nutritional Stats Per Serving (serves 6): 212 calories, 6 g protein, 20 g carbohydrates, 14 g fat (6 g saturated), 70 mg cholesterol, 2 g fiber, 161 mg sodium. Make It A Meal: Serve with Roasted Lemon Thyme Chicken or Roasted Chicken a la Nicoise or Sauteed Spinach or Sweet Mashed Potatoes . Not the kind of dessert you would expect on a skinny chef’s site….. nothing wrong with a little indulgence now and then!